Info "Hit funky buttons to the funky beat." 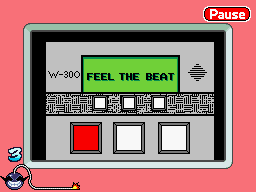 Rhythm Maker is one of Orbulon's microgames in WarioWare: D.I.Y. The point of the game is to follow the rhythm of the beat. The game starts off with a finger demonstrating the order of the buttons. Once the order is shown, the player needs to copy the person's movement to the beat of the music. If the player accomplishes the task, the game is won. However, if the player goes too fast or takes too long to press the button, the game ends in a loss. This page was last edited on December 3, 2018, at 13:39.